Shoppers carrying bags walk up Fifth Avenue in New York City. Americans are diving deeper and deeper into the red. In addition, a steady rise in student loan balances, as well as an increase in the cost of automobile financing in the fourth quarter, contributed another $80 billion. At these levels, consumers are spending about 10 percent of their disposable income on nonmortgage debts, including credit cards and auto, personal and student loans, said LendingTree chief economist Tendayi Kapfidze. Ahead of the Great Recession, that averaged about 13 percent, he added. The average American has a credit card balance of $4,293, according to the latest Experian data. 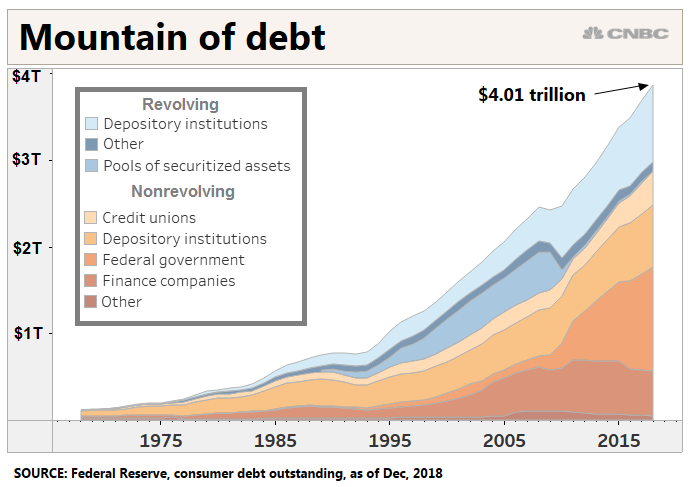 Total credit card debt is also at its highest point ever, surpassing $1 trillion, the Federal Reserve found. At the same time, credit card interest rates have never been higher. The average card interest rate is currently 17.41 percent, according to CreditCards.com’s latest report. That’s up from 16.15 percent one year earlier and 15.22 percent two years ago. And still, credit card delinquency rates, or late payments over 90 days past due, remain relatively low even though rates have been slowly rising in the last few years. Meanwhile, outstanding student loan debt has tripled in the last decade and is now $1.5 trillion. A college education is now the second-largest expense an individual is likely to make in a lifetime — right after purchasing a home.